The first image that often comes into most people’s minds when you mention “Marine Art” is of the archetypal clipper ship under full sail pounding through the high seas — an image made particularly popular through the paintings of British marine artist Montague Dawson who created thousands of clippership paintings in his long and distinguished career which lasted virtually from World War I until his death in 1973. Yet, in reality, today’s talented marine artists are exploring every aspect of life in and around the sea. This includes capturing the unique beauty of today’s modern yachting scene. While for many, the Golden Age of Yachting occurred at the turn of the twentieth century, these fine artists’ paintings make a strong argument that the beauty of yachting is equally manifest in today’s new designs and materials, as you can see from the paintings depicted here. 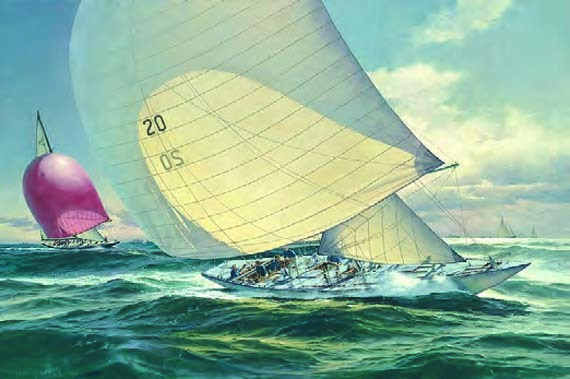 Modern yachtsman, art collector and winning America’s Cup skipper (America in 1992) Bill Koch, commissioned Artist Don Demers to depict the racing action between the American 12 meter Constellation and British Sovereign. With Bob Bavier at the helm, Constellation dispatched Sovereign in four races. Here Demers portrays the pure power of the yachts while providing us with a fascinating view of the action on Constellation’s deck. 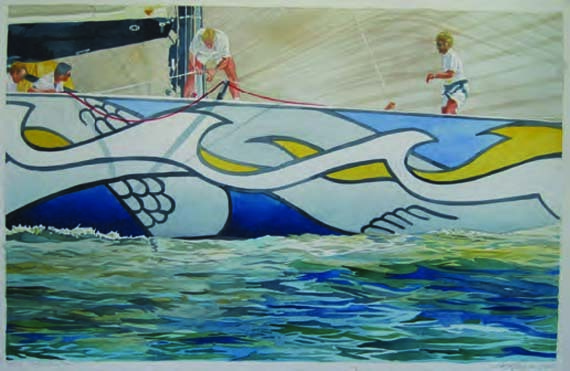 Chesapeake Bay-base Artist Marc Castelli has been sent by the San Diego-based SAIC corporation to several America’s Cup trials and finals – spending weeks on board a chase boat close into the action to capture the colorful patterns and shapes that today’s modern racing yachts create. Shown here is the distinctive Mermaid Design fashioned to decorate the hull of Young America in 1995 by famed contemporary artist Roy Lichtenstein (1923-1997). Keith Reynolds likes to rise early in the morning and venture out into the harbors of the world. 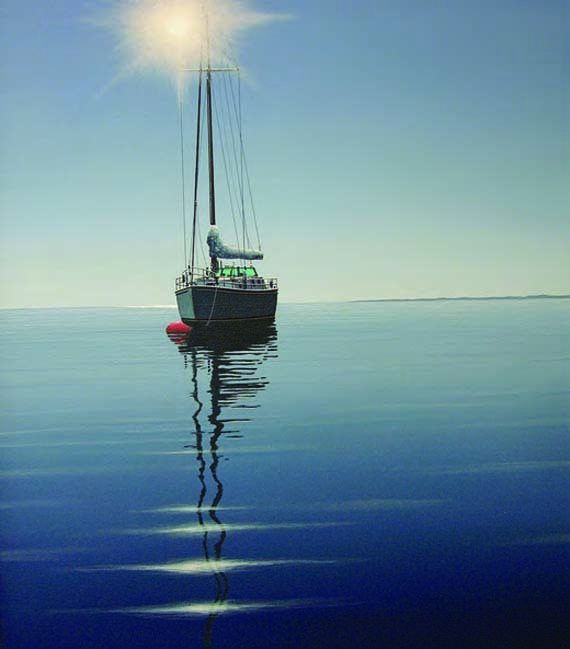 Here he captures the simple beauty of a modern yacht at anchor with a style that is as simple and pure as the moment it depicts. Ah, the J/24…One of the most popular modern-day racing boats ever. The fleet is painted here about to round the windward mark by current Society of Marine Artists President Russ Kramer. 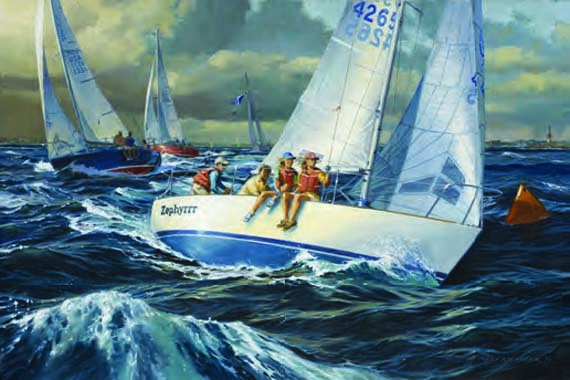 If you visited the New York or Annapolis boat shows any time between 1980 and 2005, you will never forget the sight of a tall, white-haired, bearded artist surrounded by his display of the most vibrant and colorful paintings and prints of modern racing yachts anyone had ever seen. 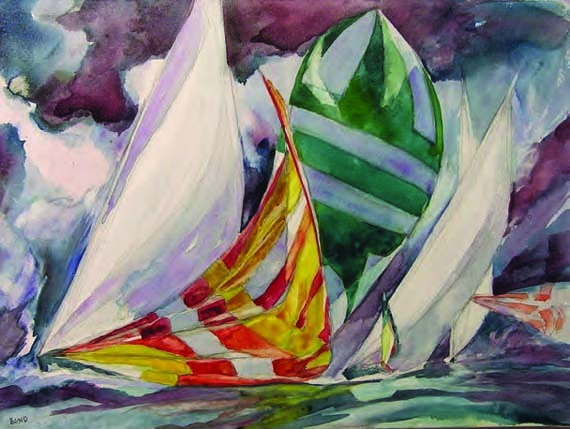 Bursting with energy like the artist himself, Willard Bond’s paintings tell the story of the play of forces that happens when boats with big sails come together to race in close company like no strictly literal depiction could! Entering Great Salt Pond is a rite of passage for many cruising and racing yachtsman from Long Island Sound and New England. The channel in takes you past the Coast Guard Station, which in itself has become a sailor’s landmark. With favorable tide and breeze you can reach your way in, as Barrister is doing here. Tom Graves heads out onto western Long Island Sound with camera in hand each weekend, capturing racing yachts from a variety of angles and points of sail. 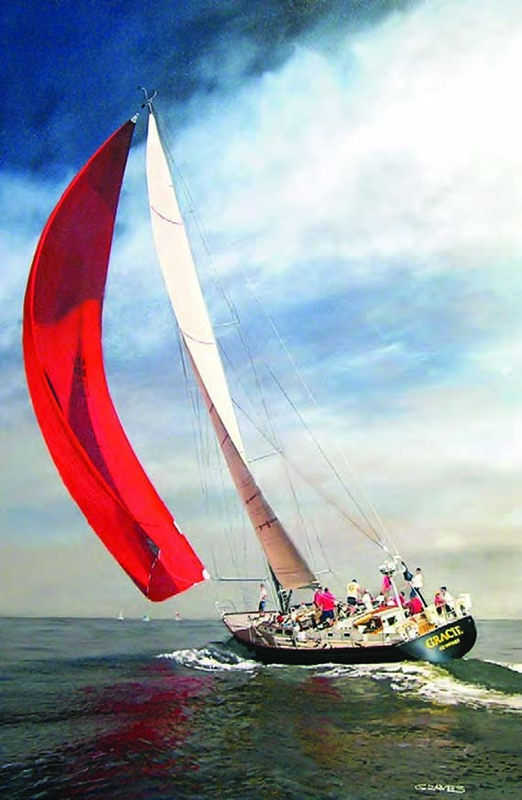 He returns to his studio to create personalized “portraits” of individual yachts like this one of Gracie, flying her distinctive red spinnaker. To view the works of the artists mentioned in this article visit the J. Russell Jinishian Gallery website at jrusselljinishiangallery.com or visit the gallery located at 1899 Bronson Road, Fairfield, CT, 203-259-8753. 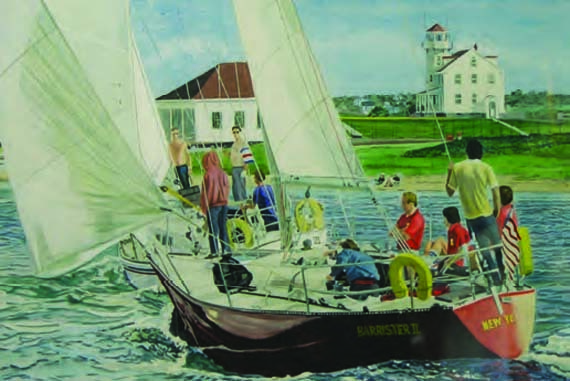 As the nation’s leading gallery specializing in fine marine and sporting art since 1997, the J. Russell Jinishian Gallery represents over 100 of the world’s leading artists, with an extensive inventory of paintings, drawings, sculpture, scrimshaw and ship models in a wide variety of subjects, styles and prices.